Leading Restaurant furniture distributor helps Logan, UT area pizzeria and grill by supplying it with bar stools and table bases. Leading commercial furniture distributor, Restaurant Furniture.net recently teamed up Bull's Head Pizzeria and Grille to a successful grand opening. Located across the street from Romney Stadium in Logan, UT, adjacent to Utah State University, Bull's Head Pizzeria and Grille offers a unique and original dining experience to students and residents alike. Their menu includes gourmet pizzas, sandwiches, paninis, burgers and more at students prices. They also have daily specials and a fully stocked bar which includes a full wine list and many craft beers. They serve lunch, dinner, and late and unique desserts and breakfast on weekends, all created from the freshest ingredients possible. Daily food specials are pulled from recipes of the customers favorite food programs and requests are encouraged. Bull's Head location is 3800 sq. feet and has 15 large screen televisions throughout the bar broadcasting major sporting events. There is a good view of sporting events from every seat in the bar except the patio, which has a great view of Romney Stadium. In addition to their regular menu and daily specials they also offer a four course beer and food pairing. Every Friday and Saturday night they offer a roasted prime beef dinner or fettucini alfredo with chicken or shrimp. Peter Miller, the owner of Bull's Head Pizzeria and Grille needed high quality commercial seating that would look great and be able to withstand the high traffic that the restaurant experiences on a daily basis. He turned to Restaurant Furniture.net because of their reputation for premium quality and strong built furniture at affordable prices. Restaurant Furniture.net supplied Bull's Head with high quality, bar stools and table bases competitive prices that fit well within his budget. For seating decided to go with Restaurant Furniture.net's Ladder Back Double Ring Swivel Bar Stools with black frames and padded black vinyl seats which are made in the USA. Customers can also choose a padded seat made of vinyl or fabric or a solid wood seat. Wood seats are available in 6 different finishes. The seats can be custom made in any material and custom wood finishes can also be made. The frame is available in black, copper vein, silver vein, gold vein or gold. The Ladder Back Double Ring Swivel Bar Stools are currently on sale for $55.50. A matching Metal Ladder Back chair is also available. 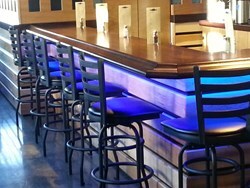 Browse Restaurant Furniture.net's full selection of commercial grade chairs, bar stools, table tops, table bases, booths and patio furniture at http://www.restaurantfurniture.net/ or talk to a customer service representative at (888) 409-1115. Bull's Head Pizzeria and Grille is located at: 1111 North 800 East, in Logan UT. They can be reached at (435) 787-2092. You can also visit their website at: http://bullsheadusu.com/welcome.html.